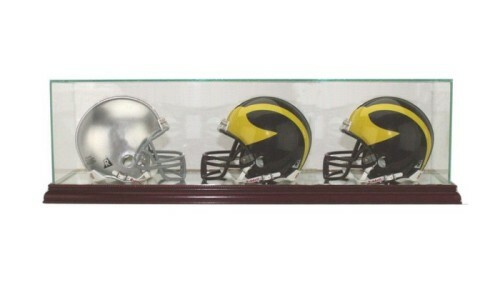 Mini Helmet display case holds 3 mini football helmets, baseball batting helmets, or hockey goalie masks. Featuring a mirrored back panel and a furniture grade wood base and real UV protected glass. The base is also mirrored so you can see the entire helmet. Interior Dimensions 21" x 5-1/4" x 5-3/4"
you would like additional panels etched or a traditional engraved nameplate - plaque, please call or email us.